Ötzi the Iceman is the gift that keeps on giving. Found embedded in a glacier in 1991, the 5,300-year-old mummy has offered unprecedented insights into Copper Age Europe. A new analysis of Ötzi’s equipment shows what he was up to in the hours before an archer drove an arrow straight into his back. The Ötzi mummy has provided scientists with an astounding amount of data in the 27 years since his body was found by hikers in the Ötztal Alps on the border between Austria and Italy. From his exquisitely preserved remains we know that Ötzi was about 45 years old when he was killed. His body was covered in tattoos (61 to be exact), and his stomach contents contained bits of wild goat, grains, and dry-cured meat. But Ötzi was also found with his clothes and equipment intact. New research published yesterday in PLoS One presents an updated analysis of the Iceman’s toolkit, offering new insights into this remarkable individual and the Copper Age community in which he lived. What’s more, the new analysis paints a clearer picture of Ötzi’s final 48 hours and the events leading up to his death. 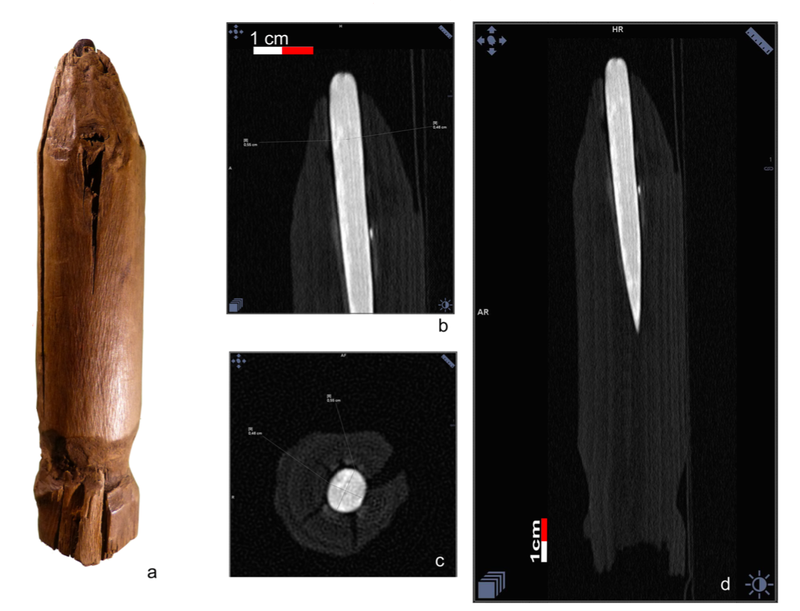 Using high-powered microscopes and CT scans, archaeologist Ursula Wierer from Soprintendenza Archeologia in Florence, Italy, took a new look at key items in Ötzi’s tool kit, including his dagger, borer, flake, endscraper, antler retoucher, and two arrowheads. Previous studies suggested all of Ötzi’s chert—a sedimentary rock that produces sharp edges when flaked, or knapped—came from a single region in Northern Italy known as the Lessini Mountains. But the new analysis suggests the stones in Ötzi’s six tools were imported from at least three different regions in northern Italy, all within 25 to 44 miles (40 to 70 km) from the valley where the Iceman lived. This means that villages were being supplied with chert from different outcrops, and that contacts were maintained over long distances. This is not a new suggestion, as a previous study showed that the metal from Ötzi’s copper axe originated from Southern Tuscany some 350 miles (555 km) from where Ötzi met his fate in the Italian Alps. What’s more, Wierer’s comparative analysis of Ötzi’s tools with other Copper Age artifacts revealed the presence of stylistic influences, including both Northern Italian traditions and more distant alpine cultures, including Swiss Horgan culture. This should “come as no surprise in the toolkit of a man who lived in a territory where transalpine contacts would have been of great importance,” write the authors in the new study. 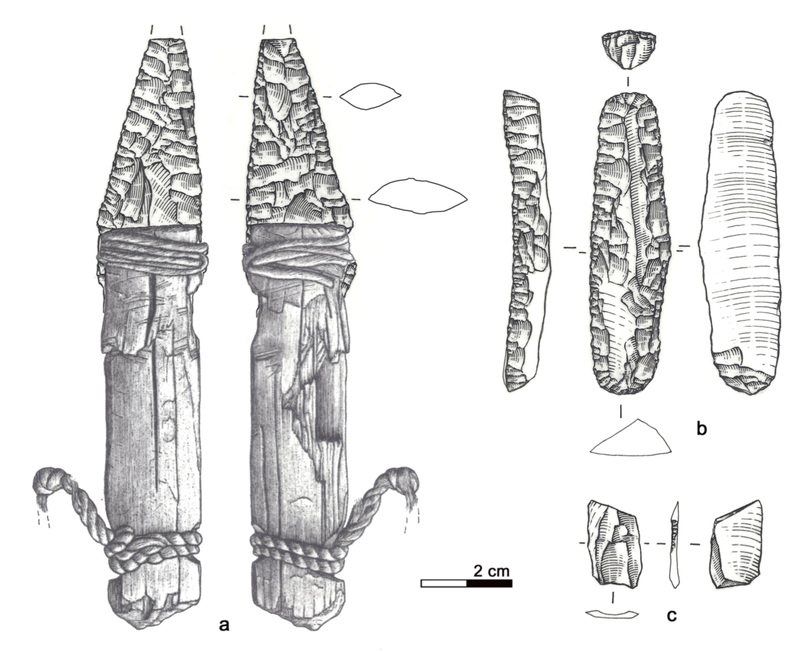 Wierer and her colleagues also examined the wear and tear on the Iceman’s tools. The distinctive flake patterns show that Ötzi was a right-handed individual, something not known before, and that he wasn’t an expert flintknapper. “The technical skill of flintworking, measurable by the regularity of work, the presence or absence of mistakes, is not excellent but on a medium level,” Wierer told Gizmodo. The tools were of various ages, and as noted, acquired from different regions. Looking at the quality of the edges, Wierer’s team suspects that Ötzi re-sharpened and reshaped some of his tools shortly before he died. He wasn’t working on any of his equipment when he was killed, as all of his tools were found in their respective bags—except the dagger, which was found lying in meltwater next to Ötzi’s mummified body. Interestingly, the dagger had a broken tip, but minimal signs of wear; the authors suggest Ötzi used his small dagger as an ornamental display, wearing it on his belt as a status symbol. As for Ötzi’s other tools, most of them displayed evidence of extensive use, and many were at the end of their usefulness. His flake, though small, was a practical cutting instrument due to its sharp edges; analysis shows the Iceman used it for cutting soft wood or reeds. Ötzi also had an antler retoucher (also known as a pressure flaker), which he used for flaking chert and for resharpening worn-out tool edges; the antler spike inside this tool was likely made from roe deer antler. This tool was made by inserting an antler spike inside the canal of a stripped branch of lime tree. The Iceman used his endscraper for various perforating, cutting, and scraping tasks, particularly when working on tough plants. Strangely, the borer, which was traditionally used to make holes in leather or wood, exhibited no traces of such work, and it was unused. 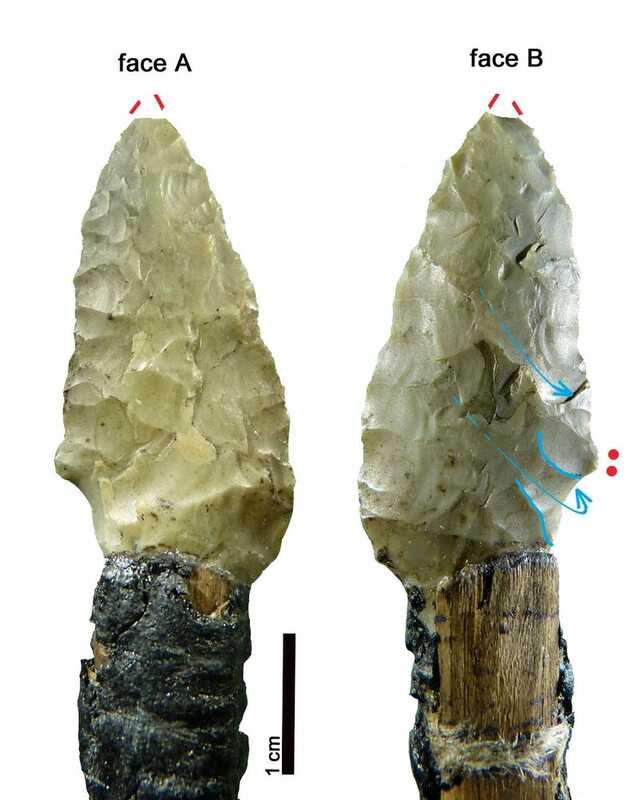 Ötzi also had two arrowheads, both of which had recently been resharpened. Taken as a whole, however, Ötzi’s toolkit wasn’t very impressive—a sign that the Iceman was in a bit of trouble. By analysing the pollen contained within the foods consumed by Ötzi, along with other prior evidence, Wierer and her colleagues were able to reconstruct his hectic itinerary in the hours before he died. Roughly 33 hours before his death, the Iceman was up in the mountains at a height of 8,200 feet (2,500 metres) above sea level. From there, he made a descent along the southern slope of the alpine ridge, reaching a location where he spent some time before making another ascent up the mountains. He climbed to a height of 9,800 feet (3,000 metres) about four to five hours before his death. Ötzi managed to eat three meals during this 33-hour period, including a final meal about two hours before he was killed. It has been hypothesized that Ötzi was involved in three conflicts in the hours before he died, the first of which is based on circumstantial evidence, namely the absence of a bow and set of arrows to match his arrowheads. It’s possible Ötzi was attacked, and his bow and arrow damaged, stolen, or discarded in haste—though no evidence exists to support this assertion aside from the conspicuous absence of this equipment. But the other two conflicts are on firmer footing, as evidenced by injuries observed on the Iceman’s body. After Ötzi made his descent to the valley below, he was attacked. Wierer says the deep wound, between thumb and index finger, must have been very disabling for him. Ötzi was right-handed, as the new evidence shows. “Therefore we can state that after this event manual work for repairing and finishing his equipment must have been very difficult if not impossible,” she said. The authors speculate that Ötzi went down to the valley below to collect much-needed equipment and raw materials (based on his depleted and worn out toolkit), but the Iceman’s arrival was met with resistance. Badly injured and likely in mortal danger, he decided to flee by going up the mountains.